We are synonymous with innovation, persistently and effectively and that what makes us illustrious as an excellent outdoor advertising company in Ahmedabad. Give us change, and we will prove it true for your brand too by digital signage kiosks, a small-sized digital billboard installed on the pole. The inclusion of the digitalization in the kiosks is an innovative way for us to make it hard to ignore promotion for every passerby and vehicular consumer. Alike to the digital billboard, digital signage kiosk in Ahmedabad is incorporated with an inbuilt player by which means one can easily upload images, videos or different text remotely employing digital signage software. Correspondingly, the same image, text or video can be uploaded to any number of signage and save the cost of the printings. Even the content can be changed remotely as many times by the same procedure without any extra efforts makes it the most versatile among the consumers in this busy lifestyle. Other than, the user also entitled to upload real-time news from social media feeds or any other recourse and make them advertisement more interesting and informative for the audience. The motion and high-resolution display of our every digital signage kiosk in Ahmedabad have convinced thousands of consumers unprecedentedly and continue to lure much more with the potential of the bright colors and motion. Our Digital Signage Kiosk Manufacturer has proven to be the best communication medium to attract the millions audience, which you also can accomplish by investing in our low-cost digital signage kiosk in Ahmedabad. 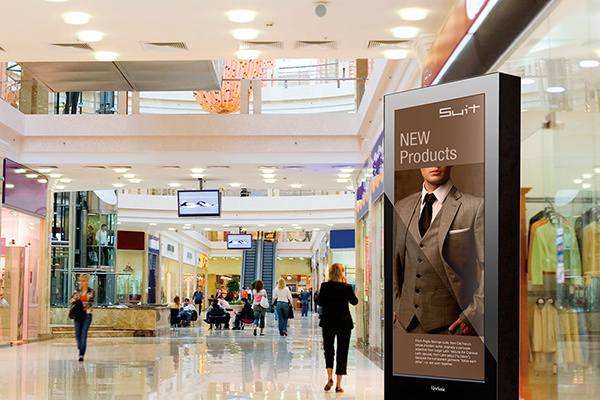 We not only help you select the location with the relevant audience but also help seize the highest consumer by strategically positioning you’re your digital signage kiosk, which is difficult for you to make possible. Be it road, airport, bank, museum, consulate or shopping mall, our digital signage kiosk is guaranteed to reach the highest audience and lift your brand to a new level.